Please join us in celebrating by participating in the following school-wide spirit days! 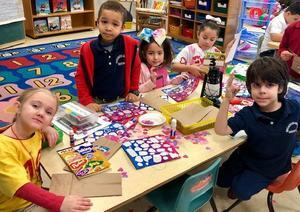 Mrs. Jaramillo’s and Mrs. Falco’s Kindergartners celebrated completing “100 days of loving learning” by rotating through 100th Day and Valentine’s Day themed small group activities. Mrs. Wurst's 5th grade G&T students conducted research on how companies differ from products and brands by comparing and contrasting distinguishing characteristics. Students experienced how to become shareholders in a company by participating in The Stock Market Game simulation. The benefits, obligations, growth, control and risk of a company going public vs. remaining privately held company were all part of this real world multidisciplinary unit. Clarendon School Winter Recess. School Closed Friday February 15th, Monday February 18th, and Tuesday February 19th. School re-opens Wednesday February 20th. Ms. Hensle’s class participated in a STEM team challenge. 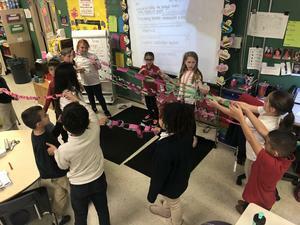 They had to work together with their team to see who could make the longest paper chain using only two pieces of paper.